A stack of plates with cookies to share with a crowd. Suggested serving is 1-2 cookies. A small bowl with 2 servings of nuts to share with a crowd. A custom sweet and salty trail mix with Planter’s Deluxe Mixed Nuts Mix, white chocolate chips, pretzels, dried cranberries, dark chocolate covered pomegranates, mini marshmallows and pretzels. 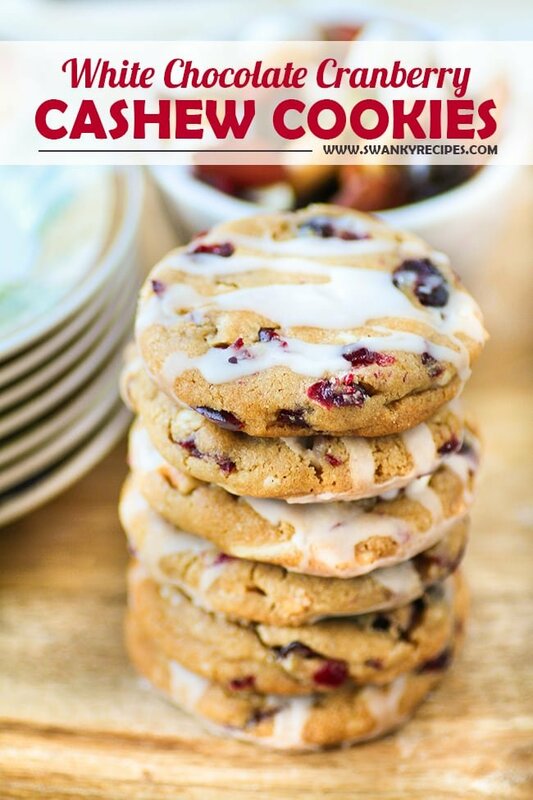 Made into a holiday gift jar with white chocolate chunk cookies stuffed with dried cranberries and cashews then topped with an iced glaze. The holidays will be here soon and if you’re looking for some festive inspiration, look no further. Get the kids together and make homemade food gifts this season that pack a lot of meaning. We’ve made a sweet and salt trail mix and paired with homemade cookies then placed them into mason jars for one tasty food gift! Homemade food gifts are great gifts to grandparents, relatives and friends. They also are great to give to teachers and coworkers. Nothing compares to holiday baking and the all creations that come out of family kitchens for generations. I know in our family, the holidays are a very special time for us. We spend a lot of time together in front of the fire talking as well as in the kitchen cooking and playing in the snow (when we visit Wisconsin). When it comes to this time of the year, we’re all about family. I love every bit of it and will always cherish the holidays. 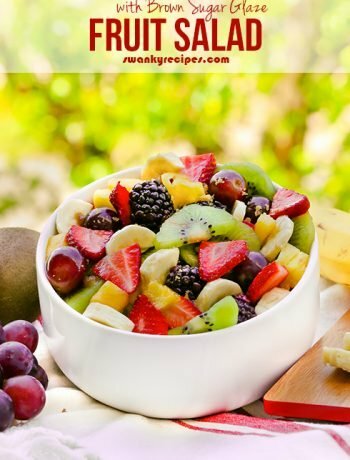 The first photo below is 2 servings mixed trail mix. The second photo is to show what 1 serving looks like, set in a small bowl with two cookies below. Both these items can be placed in the mason jar as a gift. 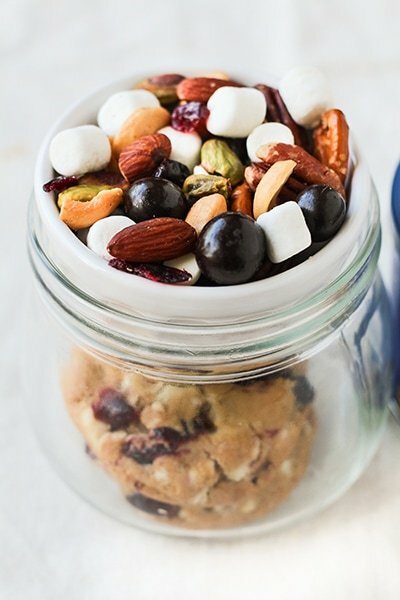 To make this custom Sweet and Salty Trail Mix for a holiday gift, place 1 cup Planters® Deluxe Mixed Nuts, 1/4 cup white chocolate chips, 1/2 cup mini marshmallows, 1/4 cup dried cranberries, 1/2 cup pretzels, 1/4 cup chocolate covered pomegranate seeds (or raisins) in a medium size bowl. Toss everything together. The holiday season is the best time to put out the good stuff! Planters Nuts have a unique combination of good fats, dietary fiber, and vitamins and minerals. Nuts make a deliciously powerful addition to any holiday festivity. 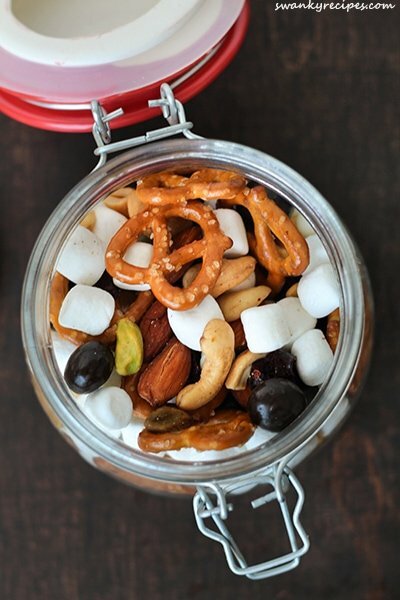 Whether it’s a custom trail mix you’re making or just placing them in dish, they’ll be a big hit to snack on. 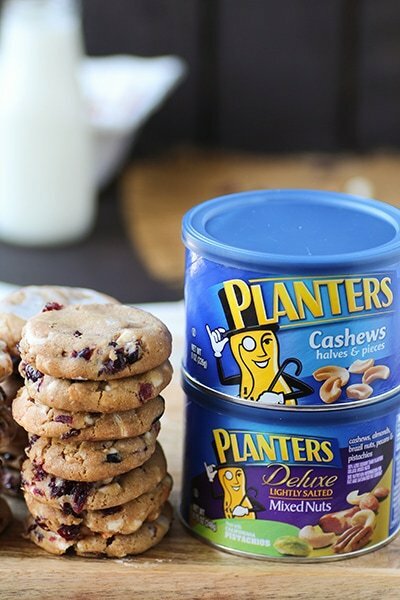 Planters Cashews and Planters Deluxe Mixed Nuts make holiday party entertaining simple and easy. 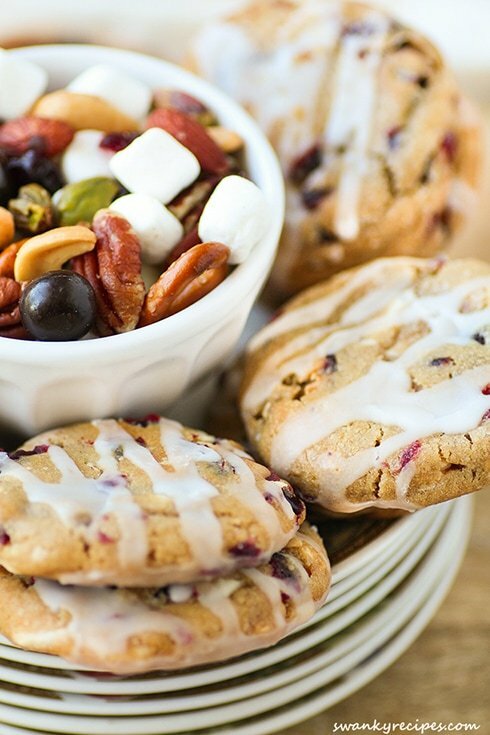 A stack of plates with 7 cookies and a serving of trail mix to feed a crowd. Homemade mason jar cookie mixes are all the rage this season. Trendy gift jars stuffed with cookies, nut mixes, snacks and attached with a recipe is the perfect gift to give your loved ones this holiday. Anyone that knows me knows I love making my own gifts to give to those who I love. Cookie dough being mixed, do not consume raw. The second photo shows which nuts I’ve used for the recipes along with cookies for a crowd at our holiday party as well as for a food gift for numerous people. The dough for the cookies is incredibly easy to make and can be made ahead of time. One dough ball is equivalent to one serving, once baked. I’ve Used both Planters Cashews and Deluxe Mixed Nuts to serve to guests for the holidays and include in a gift jar. Mason jars gifts are a thoughtful way to give gifts during the holidays. I also like to include kitchen items like spatulas, cookie sheets and coffee mugs and other must have kitchen utensils that I just adore. Here I’m getting ready to put a glaze on the cookies. Serving size is 1-2 cookies. This time of year inspires me to do a lot of holiday themed baking and activities with the family. The weekends are a great time to get together with the kids, friends and family. Spend the day inside wearing a cozy sweater next to a roasting fire while the kids help make food gifts, sip on hot chocolate and enjoy a serving of Planters Deluxe Mixed Nuts. Planters has been an American favorite for over 100 years and has been part of our holiday tradition since I was a kid. The first photo shows 1 cookie, the recommended serving size. The second photo is a styled shot of a stack of cookies on a serving tray for a crowd of people at our holiday party. You can find more news from Mr. Peanut at Planters.com, Facebook at Facebook.com/MrPeanut and on Twitter at @MrPeanut. A custom sweet and salty nut mix with Planter's Deluxe Mixed Nuts mix, white chocolate chips, pretzels, dried cranberries, dark chocolate covered pomegranates, mini marshmallows and pretzels. 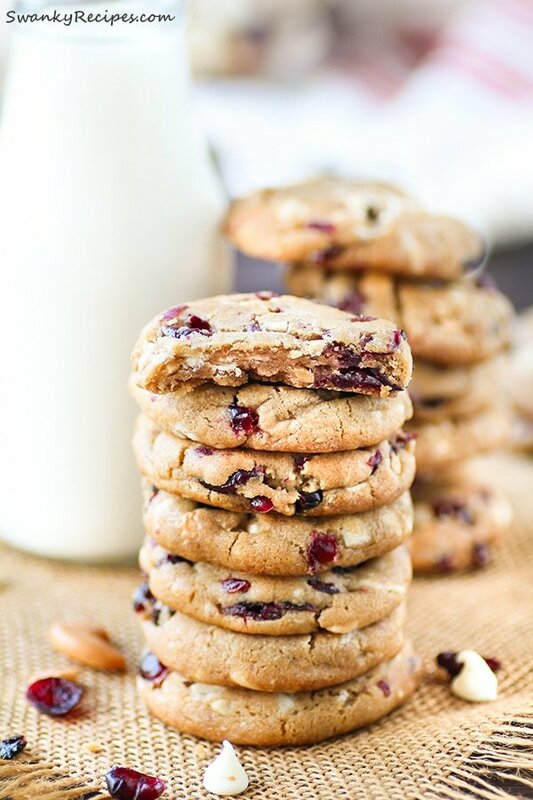 Made into a holiday gift jar with White chocolate chunk cookies stuffed with dried cranberries and cashews. Topped with an iced glaze. *Place 2 servings into a gift bag or mason jar with 2 cookies for a holiday gift. In a medium bowl, whisk together flour, cornstarch, baking soda and salt; set aside. Coarsely chopped cashews and white chocolate (or simply use white chocolate chips if desired). In a bowl fit with a mixer, cream room temperature butter for a minute. Mix in granulated sugar and brown sugar and mix on medium high speed for a few minutes until light and fluffy. On high speed, beat in room temperature egg and vanilla extract. On slow speed, slowly beat in dry ingredient into wet mixture. 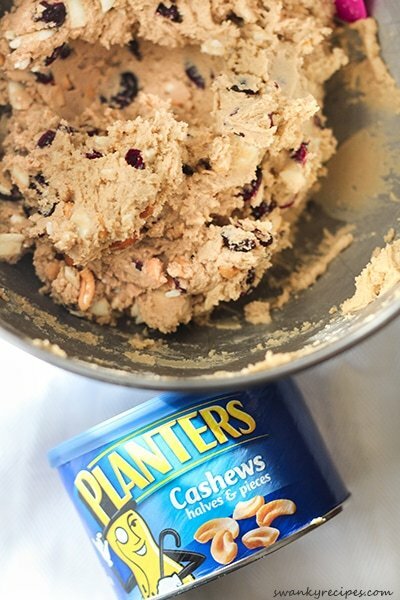 Turn off mixer after dough is formed and fold in white chocolate, Planter's Cashews and dried cranberries. Cover dough or wrap in saran wrap and refrigerator for at least 2 hours or up to a few days. Prepare a cookie sheet with parchment paper and preheat oven to 350 degrees F. Using a 1 inch cookie scoop, form dough balls or roll dough between hands and place on prepare sheet. Pat dough slightly done and place in oven for 11 minutes. Using the back side of a spoon, flatten the cookie top slightly down and place back in oven for 1 minutes. 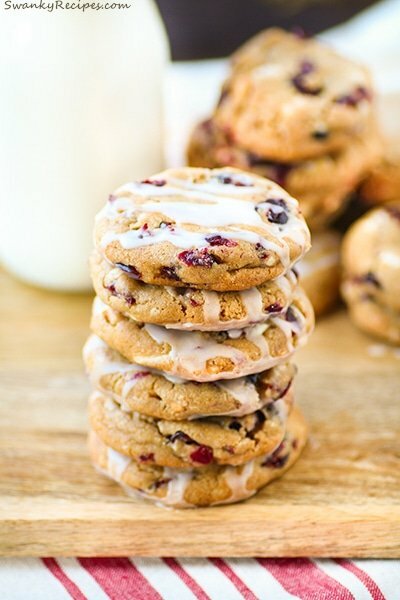 To make glaze, in a small bowl, whisk powered sugar and water and drizzle over the cookies. To get a room temperature egg, warm it under a medium heat faucet for a minute or two. Be careful temp is not too hot as it could bake the egg. *While this recipe takes only 20 minutes to make, the dough needs to rest in the refrigerator for at least 2 hours or up to a few days. ***Dough can also be frozen. Simple wrap in saran wrap and place in freezer safe zip lock bag. Allow to defrost on counter top slightly before baking. I was selected for this opportunity as a member of Clever Girls and provided product samples by Kraft Foods, and the content and opinions expressed here are all my own. 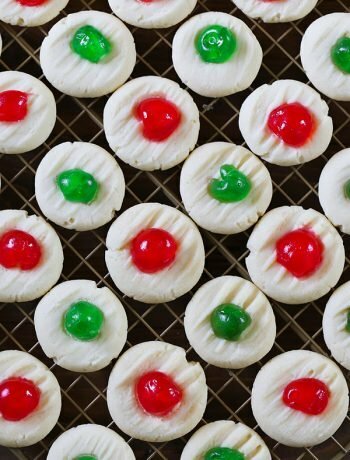 I don’t know why but cookies during the holidays always seem to taste better. Maybe because there is more variety to choose from, and these look like so much fun to make and eat. That looks so yummy! I just got a bag of craisins yesterday. I will make these cookies. Both of these recipes look delicious. 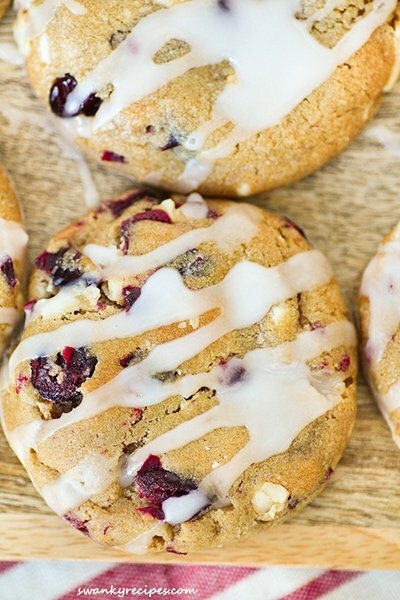 I love the combination of cranberries and white chocolate. These would make great gift ideas. Your photos are amazing. You did a great job of making me want to try these recipes. I think the kids would love to make these as teacher gifts. Ooooo these cookies look behind delicious. 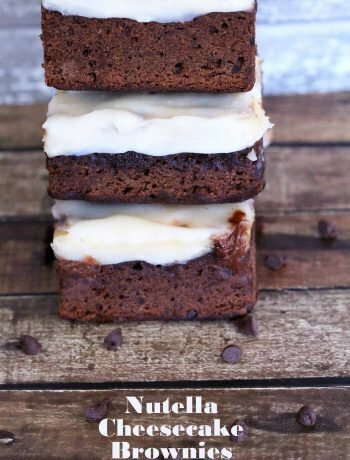 Tis the season for baked good so I might just have to give your recipe a try!